Friends, I couldn’t wait to share our good news with you! Our baby girl came early, on February 18th and we got to bring her home on Saturday, which happened to be my birthday! This is seriously the best birthday present ever! She is doing so well and is healthy and thriving and very peaceful so far! Big brother is also smitten and I have to thank our friends and family, who are going above and beyond to be helpful right now, bringing meals and showering us with love. It’s such a sweet, sweet time in our lives. Y’all have been so supportive and encouraging throughout this pregnancy, and I’m truly thankful to be able to share our newest family member with you. I’m feeling ultra protective and vulnerable right now and just want to keep her close to my chest at all times. I’m sure we’ll reveal her name in due time, but for now, it’s baby steps for this mama. I guess it’s all part of the emotional process that goes along with pregnancy and childbirth making me feel like my heart could burst open at any moment and I need to go slow. I’m also recovering, so just taking it easy at home for now and will be back to blogging when I feel up to it (and the drugs wear off! 😉 Love you friends! Next Post Introducing . . .
She is perfect! Congratulations to you and your family and very happy belated birthday! Wishing you a happy healing! Congratulations to your family! She is just precious! Take this time to rest up and enjoy your new babe!! Sending you all so much love and well wishes! I send you and your family the very best of wishes for a wonderful recovery and celebration of her life and new beginning for your family. Congrats Megan! I am so happy that everything went so smoothly and you now have your beautiful daughter. I really appreciate you sharing your pregnancy and I cannot wait for my little one to come in March! Enjoy your time! Lots of love from Arizona! Congratulations Megan, she's absolutely precious! So happy for your family! Congratulations!! So happy for you and your family! Cannot wait to find out more about your beautiful daughter! Happy birthday to you AND your beautiful baby girl! Congrats! So happy for you! Take all the time you need and we will look forward to having you back when you are ready! She is beautiful! Congratulations Megan! She is precious!! Oh, Megan!!! She's perfect! My mom (lucindapdc) told me she saw your post on IG the other day and I was so tempted to break my Lenten promise and log on to sneak a peek (but I didn't!). Seeing her here today is the perfect start to my week – and I am so happy for the opportunity to congratulate you. Take all the time you need…and enjoy, mama. YAY! Congrats! She is precious! Congratulations! Can't wait to hear all about your precious baby girl. I was thinking about you this morning, then right away this post popped up! So excited for your sweet family–get some rest and enjoy every moment! She is beautiful! 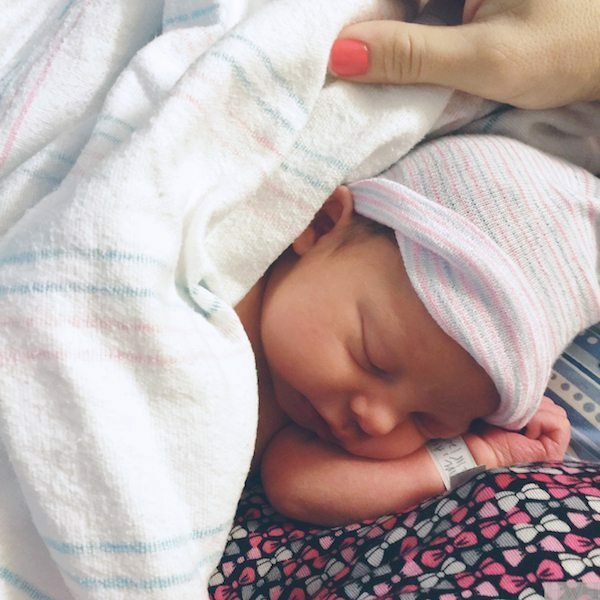 Congratulations to everyone, your baby girl is adorable. Enjoy these precious moments. Yes, what an amazing birthday present!! She is just beautiful Megan. 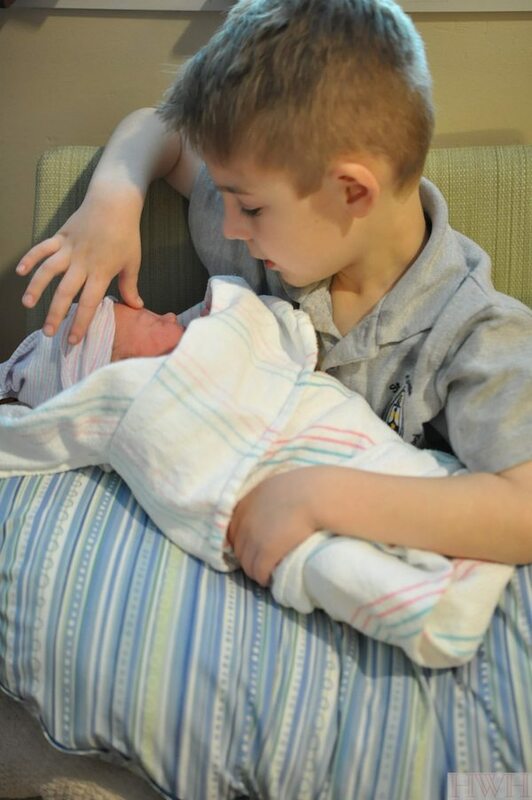 And, James is going to be such a wonderful big brother, and a tremendous help to you. Praying for healing for you. Enjoy you sweet new bundle. She's so beautiful. Congratulations to you and the entire family. Beautiful! Congrats! Enjoy your time with her-I didn't realize how fast time flies by!! Oh I'm so truly excited & happy for you and your sweet family! I know all of us who follow you were on the edge of our seats! Congrats and take this time to soak up all of these precious moments! Take care?? Congratulations! She is beautiful! Get some rest and enjoy this precious time! Congratulations Megan (and family)! Must be something in the universe making these little ladies in a hurry to join us…my first granddaughter decided she wanted out two days after my daughter's birthday and two weeks early! Enjoy every moment and can't wait to watch her grow along with James…hope you also get some rest, even if only occasionally at first! Megan, I am a new follower… just found your blog over the weekend. I am loving what I have read so far and am excited to continue reading more. Congrats on your new sweet baby girl! She is just beautiful. Glad everyone is healthy and big brother is excited!! She's beautiful!! Enjoy every minute!! Congratulations!!! She is so precious and I love the pic with your son. Big Brother is going to take good care of her. Congratulations, what a joyous time! Many blessings to you and your family. She is so beautiful and happy belated birthday to you. Enjoy your time with your family!! YAY! What a wonderful birthday, blessing for your little family of 4!!! She is precious! And James too. Enjoy every second – it goes so fast. Congratulations to you all. I look forward to seeing more photos as you feel up to it. Take care of yourself and enjoy those sweet children of yours! Oh, Megan, she's absolutely beautiful–but how could she be anything else, with you as her mama? Many, many congratulations to you and your family. You've already been blessed beyond your wildest imaginings, I know; may the Lord continue to bless you!! Congrats!! She's gorgeous, and I bet James is already the BEST big brother! Megan,what a wonderful time for your family. She is adorable. Thank you for sharing your beautiful family with us. Many congratulations to you and your family, Megan! Found your blog a couple months ago and been following it, so thought I'd finally comment for this occasion (even if it'll get lost with your thousands of other followers are saying the same thing lol!). Just had a baby myself a few months ago so loved seeing your pregnancy fashion and reading about your nursery preparations. I don't have an Instagram (I simply stalk my favorites!) but was checking your page constantly after you posted you went to the hospital early! My little guy came early too. And for her to come so close to your birthday!! What a great present indeed! 🙂 I am so excited to hear what name you guys picked out – I know it's gonna be perfect. Enjoy this magical time! Congrats! happy birthday to both of you!!! yeah for girls and babies and mamas! Congratulations! She is beautiful like her mama! Congratulations on your baby girl, she is so precious! I swear I feel like this was just me, and now our little Sully girl is 10 months old! Oh how time flies. You take all the time you need to rest and enjoy your sweet new little love. Awe, this precious little piece of stunning!!! Congrats Megan!!! Enjoy every little moment! Also, I can totally relate to what you said, which is why no one ever sees any of my family on my blog or social media. Highly protective! So I'm your girl – I get it! And it's totally ok!!! Enjoy this time …. every single second! Oh, she is BEAUTIFUL! Snuggle in and enjoy the time with your family! Congratulations! Congratulations! You have a beatiful family! She is beautiful! I understand the protective mama thing totally! Take all the time you need! Congratulations to you all. Enjoy every second with her, she's beautiful. She is so adorable! Glad that she arrived early and is healthy. Congratulations and belated Happy Birthday! Hope you heal up quickly. Yay! Congratulations to you all. She is beautiful. Take your time & we all look forward to hearing more updates when you're ready.